The Reference plane tool lets you define the plane in which Euclidean measurements are made. This is important because measurements such as angles, distances, velocities, and accelerations must be made in meaningful world coordinates rather than in meaningless image coordinates. The following information is necessary to accurately map the reference plane to the world plane. 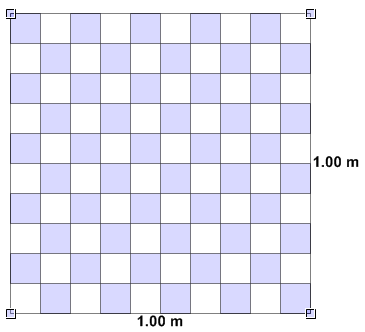 Any of the four corners (handles) of the reference grid can be moved independently to estimate the perspective projection of the world plane in the image plane. The reference grid will remain rectangular when moving any of the four corners (handles). This means that the image plane will stay perpendicular to the principal view of the camera. In Lock perspective mode, the grid will remain rectangular. The grid can be positioned anywhere in the image by moving it, or by redefining its four corners (handles) as shown below. In Perspective mode, APAS/Wizard will draw vanishing lines and vanishing points to aid in correcly identifying the reference plane. Input width, height, and units to define the world coordinate system. Generated on 4/22/2019 5:08:24 PM (PST) ADI/HQ/GBA/2019/ARIELCLOUD/v3.0.2018.0126.